How often should you change oil? Air filter: when to replace? Drive belt: should you change it? Timing chain: when to replace? Home > Car Care > How often should the wheel alignment be done? The wheel alignment is the process of checking and adjusting the angles of the wheels relative to each other and to the car body or frame. 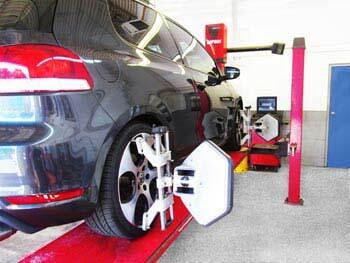 To perform the wheel alignment, the vehicle is placed on an alignment rack (in the photo). Special sensors are mounted to each wheel. Performing the wheel alignment on the alignment rack. The computer uses the sensors to measure the actual angles of the wheels (called toe, camber, caster, etc. ), so the technician can compares them to the specifications for the vehicle. Based on the measurements, a technician corrects the wheel angles that can be adjusted to the specifications. Before doing the wheel alignment, the technician should test drive the vehicle, adjust the tire pressure, as well as check the ride height and basic suspension and steering components (e.g. ball joint, tie rod, strut, etc.). Can you get an alignment with bad tie rods or control arms? No, if any of the steering or suspension components is bad, it should be replaced before the wheel alignment. After the alignment is done, you will usually get a printout showing the wheel angles before and after the alignment. 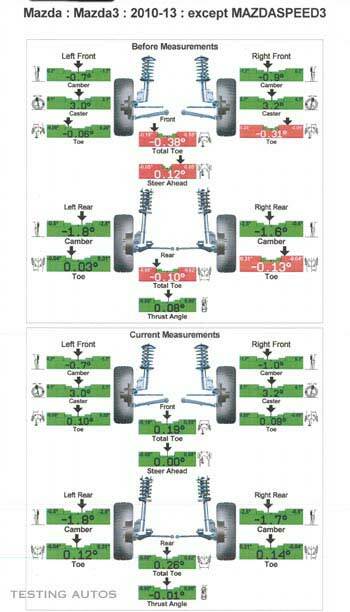 See the sample wheel alignment report below. The top portion shows measurements taken before. As you can see, some angles are in the red, which means that they are out of specifications. The bottom portion shows all angles are within specifications (green). Click on the image to see a larger view. A 4-wheel alignment is always the best option, as the 2-wheel alignment involves adjustment of only two (front or rear) tires. Why does the wheel alignment need to be done? The wheel alignment needs to be done because over time the wheel angles change. This happens as a result of deforming and wear of various rubber bushings in the vehicle suspension and sagging of the springs. Besides that, the wheel alignment needs to be checked after hitting large potholes and curbs, as well as after accidents. The wheel alignment printout shows wheel angles before and after the alignment. Angles that are marked red are out of specs. The wheel alignment also needs to be done after replacement any of the major suspension or steering components. Similarly, it should be done when lowering or raising the suspension. What are the symptoms of improper wheel alignment? How often should the wheel alignment be done? For most cars, there is no specific requirements. Your mechanic will typically recommend doing the wheel alignment every two-three years. Often, the wheel alignment is recommended when new tires are installed. The alignment should be done more often if your car has wider tires or if it's a sporty car, e.g. Audi, BMW, Mazda 3, Nissan 370Z, etc. From our experience, we can tell that if you re-check the wheel alignment after a year or two of driving, usually it will be slightly off. If you hit a large bump, the alignment will most likely be off. However, if your dealer or repair shop insists on doing the wheel alignment once a year, we don't think it's necessary, especially if your vehicle drives straight and tires wear evenly. What are the benefits of doing the wheel alignment? Your tires as well as suspension and steering components will last longer and your vehicle will handle better. You might notice that after the wheel alignment, the car holds the road better and feels more stable. Again, this is even more noticeable if you have a sporty car or wider tires. How much does it cost to do the wheel alignment? The prices vary between $50 and $180 depending on the vehicle. You might be charged more if some of the adjustments are badly rusted or seized. For better results, look for a repair shop that has a newer, more advanced wheel alignment rack. On average, the wheel alignment takes from 40 minutes to an hour. When do tires need to be balanced? When do coil springs need replacing in a car? When does a tie rod end need to be replaced? When struts and shock absorbers should be replaced? When do the control arms need to be replaced? How often do brakes need to be serviced? Why a steering wheel shakes when braking at high speed? When a drive belt should be replaced in your car? When does the timing chain need to be replaced? How often should an engine air filter be changed? When do spark plugs need to be replaced? When does the valve cover gasket need to be replaced? When does a throttle body need to be serviced? How often does a car need a tune-up? When does a car battery need to be replaced? What can cause a car battery to drain overnight? When should you change your automatic transmission fluid? When does the axle seal need to be replaced in a car? When transfer case oil should be changed? When does a wheel bearing need to be replaced? When to replace sway bar links? © TestingAutos 2012–2019. All rights reserved.